This is the last Roma Wines sponsored program. It seems to have been rushed together. As we know, when something happened that was unanticipated, it usually resulted in a repeat performance of a script. Roma's dissatisfaction with the cost of production weighed against whatever sales boost they got led them to cancel sponsorship earlier in the year. Then they were embarrassed into two 13 week renewals after the Peabody Award for 1946's Dead Ernest, announced in April. By November, everyone knew it was over. 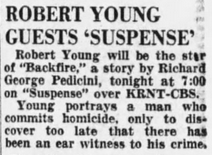 Suspense would have a few sustained weeks thereafter, and the series was essentially cancelled. The factors that led to the rather awful hour-long version that began in January 1948 have been previously detailed. I've always taken the announcement of an "all-star cast" in this episode as "we couldn't afford a big movie star this week" or "we'll show you, Roma, we can put on a big show without those extra fees" but also as a nostalgic farewell opportunity for the supporting cast who did all the heavy lifting as the Roma sponsorship came to its close. 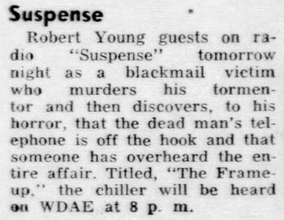 No worthwhile newspaper clips -- it seems this episode was not highly promoted. No newspaper clips for this episode. Because it was sponsorless, it seems there was no incentive to promote it. 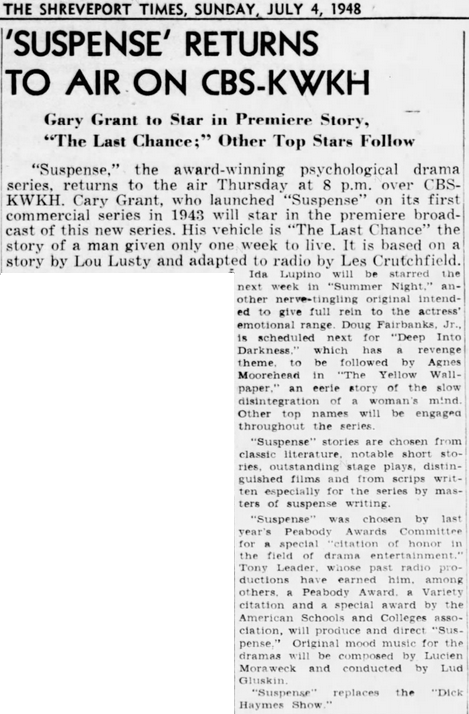 At this time, at least from looking at the trade publications, Suspense was scheduled to have its final broadcast three weeks later. We know that didn't happen, probably with William Paley's insistence that Suspense could survive with a new sponsor that would bankroll the radio version and a new TV version they had in the works. It seems Auto-Lite was in his back pocket by the end of January, 1948, but the details were not worked out until months later. Lux Radio Theater achieved high ratings in a one hour format, so the attempt was made to have Suspense adapted for that format, too. 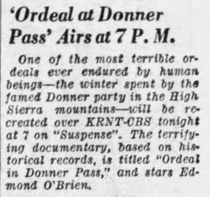 CBS had nothing really good to offer for an hour on Saturday nights at that time, so the dreadful experiment began. For six weeks, Suspense repeated scripts used earlier in the series, with padded stories to fill the time. Keeping the series on the air would keep the brand in the market and make it easier to recruit a sponsor... and if this 60-minute slot could draw an audience, a sponsor would find the new version to be very appealing. 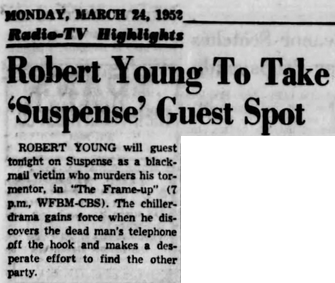 But Suspense was effectively cancelled in December 1947, so the production staff was not really ready to put such a program on the air. Don't worry... there's always old scripts, and those are cheaper to use! Budgets were austere for a program without a sponsor to pay for the production. The recruited actor Robert Montgomery, whose career was hot at the time, to become the narrator, trying to give the series more of the feeling of a big Hollywood production. The first was The Black Curtain, which was also the script used for the first Roma Wines episode. Was this a subtle swipe at the winemakers who underwrote the episode five years before? 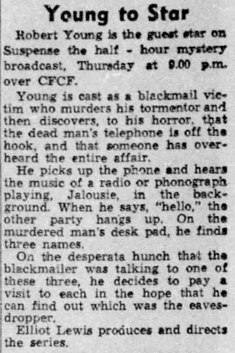 It might have been desperation that led them to stage a Sam Spade two-part story that was used in that series in 1946 (it's not in circulation, so OTRdom is glad to have this version, for sure!). Spier was the producer of Spade, so it was easy to grab that one in a rush. It seems Spier was pushed out of Suspense not long thereafter, and was hired by ABC to fix their series The Clock. But the choice of a Spade was interesting, perhaps hoping to interest its listeners to become part of the Suspense audience in this new format on a new night. 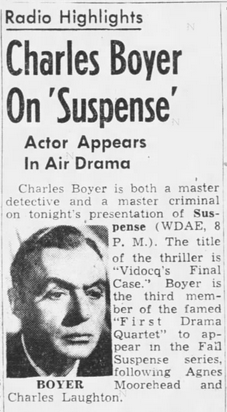 Suspense even repeated The Lodger, the story used when Suspense was just an idea in 1940 for the CBS series Forecast when the series was envisioned as an Alfred Hitchcock branded offering. Montgomery was becoming a problem, demanding more money when he was producer and also an actor in episodes. Paley seems to have toyed with him like one plays with a cat, using Montgomery as the shiny object everyone looked at while he was already undermining the hour experiment by February, just at the time when the new Suspense was starting to use original scripts for it! The proposed Auto-Lite contract called for half-hour shows. 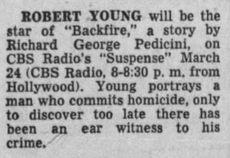 The final one-hour Suspense was to be April 10, 1948, presenting a radio version of the movie Crossfire. It is possible that the script was originally destined for Lux. The show was granted a couple of more weeks survival, probably because CBS could not fill the time in any other way. They even had a half hour repeat performance of Life Ends at Midnight before the clock ran out on this sloppy and thankfully brief experiment of hour-long plays on May 15 with Deadline at Dawn. It must be noted that many newspaper articles of the time were more positive about the series as a 60 minute drama than is considered here. Those articles were at the beginning of the experiment, before the disputes with Spier, the problems with Montgomery, and the lack of an audience played themselves out. There are virtually no articles about Suspense in the newspapers from February through April. Even the newspapers became bored with it all, or at least it seems that way. In July, all would be right with the Suspense world again, as Auto-Lite would initiate its sponsorship and producer-director Anton M. Leader would breathe new life into the series. Our next upgrades begin with the second episode of that run, and will be posted here, tomorrow. Suspense returns to the air! 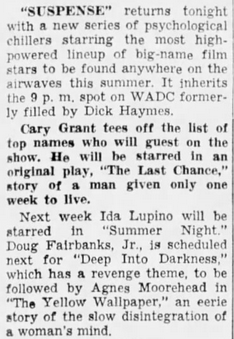 The first Auto-Lite show is Last Chance, starring Cary Grant. CG also starred in the first Roma Wines sponsored program. Unfortunately, a recording of this historic Auto-Lite premiere does not exist. But, research this past year has shown that it was not a one-time performance. It was re-presented as Death Sentence starring John Garfield on November 4, 1948. 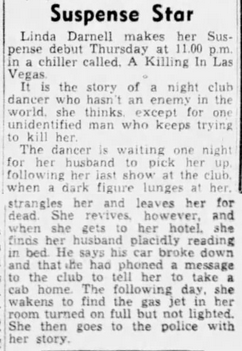 Here is a review of Last Chance from the July 14, 1948 edition of Variety. 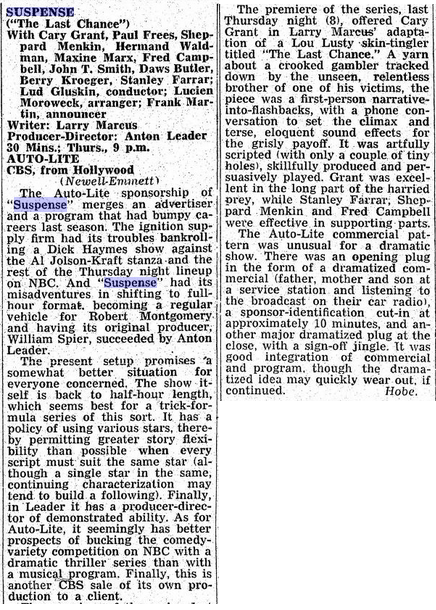 Note that the newspaper above said the script was adapted by Les Crutchfield; this review says it was Larry Marcus. The title seems like it was never settled until a few days before broadcast. 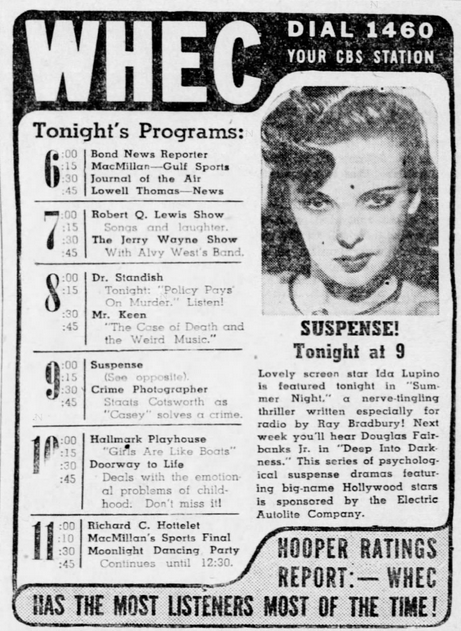 No newspaper listings in the searches had the final title as broadcast. When the program was produced in Australia for the series Tension by Grace Gibson Productions, Murder of Necessity was changed to Crime of Necessity! This may not be a significant sound upgrade for you but is one of my "completist" recordings because of the opening tone. My suspicion is that it is an aircheck or an archived recording from the network feed. The show’s original title was probably Vidocq based on these clippings. Congratulations on retirement, old sport. I too just retired in May, now finding a new rhythm to life. The link appears to be missing "a key," according to the site. Perhaps another link would help? O’Brien’s acting seemed strange to me when I first heard it – wooden, reserved – but by the end of the episode you realize he was holding back because of the bigger scenes later. What’s wrong with this news clipping? This is the first time this script was ever performed on Suspense. The producers of Suspense were also involved in Escape and Romance. In addition to production staff and actors, the three series also shared scripts. They often considered the three series as practically “the same” in terms of their required efforts and preparation. How did this happen? Someone in CBS publicity sent out incorrect information, OR the newspaper’s editor made a mistake. It was the former. We know for certain it was CBS because the error is found in other newspapers. 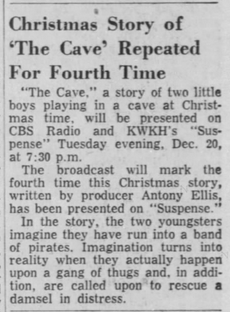 Romance would disappear from the airwaves two weeks after the final performance of "The Cave."